Make your tournament winners feel extra special with this stunning crystal soccer ball. Cuts and bevels give it a realistic look that catches and reflects color and light for added beauty. The unattached crystal base can be personalized for your event to acknowledge skill and achievement on the soccer field. This crystal soccer ball is packaged in a lined gift box for added elegance, and is available in 3 sizes. 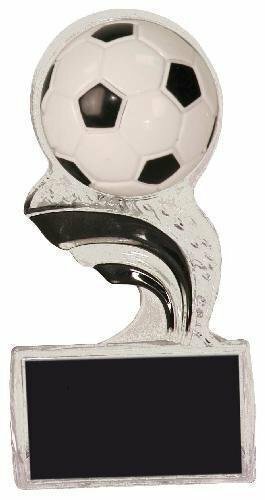 The topper on this trophy features a rising star design, and a full color soccer ball, and it can be customized in full color with the graphics of your choice. A sparkling blue column adds height to your award that is also embellished with a full color soccer ball trim. All mounted to a black weighted base with lots of room to personalize, you have a trophy that is truly unique and will be proudly received.